RTT Group is the Australian, New Zealand and Pacific sales agent for Dynamo Micropower. The PowerCore is a gas turbine purpose built for the unique needs of the oil and gas industry. Any-Gas™ combustion technology eliminates the need for costly diesel supply chains or fuel conditioning systems, while Any-Load™ power architecture maintains unprecedented power quality enabling equipment such as pumps to operate reliably and consistently in the field. The PowerCore is an onsite power generator which is designed for prime power applications, can form its own local power grid and is UL1471 compliant. Powered by a gas turbine, the PowerCore requires minimal maintenance and is reliable with warrantied availability of 98%1. By using a Dynamo, customers can save up to 80% on their energy costs. An advanced vortex stabilized combustor enables the PowerCore to operate on associated petroleum gas ranging from 700 to 2400+ BTUs/SCF. The broad operating envelope eliminates the need for diesel or expensive fuel conditioning. The unit is self tuning as fuel conditions change enabling fuel hot swapping on the fly with no user intervention. Any-Gas means no longer having down time due to missed fuel deliveries. Hybrid power design leverages ultracapacitors to enable high quality load following and power delivery. Designed specifically to support the cyclic loading of pumpjacks, the PowerCore can deliver instant power in 200 ms and sustain over 10 Million pump jack cycles. Any-Load architecture means no more oversizing generators to meet your pumping needs. 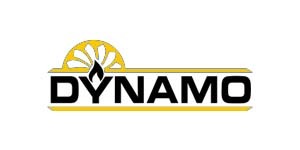 Dynamo’s turbines are built for the rigors of the oilfield with expected MTBF of 40,000 hours. Controls are intuitive and easy to use, and is designed to be inherently safe. Packages are designed to simplify delivery and installation off road, and come trailer or skid mounted. Operates with up to 50% water / mass including slugs in the fuel line.